It’s a Good Night for Stargazing – Catch it Early! 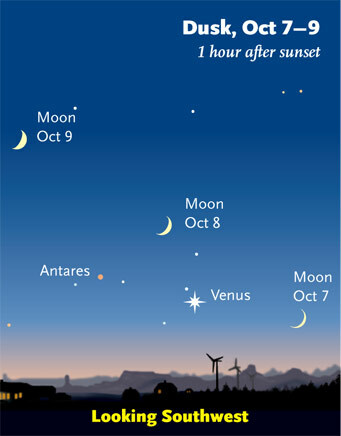 See Venus dance with the Moon and Antares, followed by the International Space Station! Tuesday, October 8: The Moon shines above Venus in twilight. Depending on where you are in North America, the Moon, Venus, and fainter Antares form a nearly equilateral triangle, as shown at right. Translation: Look to the southwest at exactly 8:13 PM. It will appear low in the sky at first. Austin lights will interfere for a bit but be patient. It will rise silently as it heads in a northeasterly direction until it reaches a maximum elevation of 72 degrees (straight overhead would be 90 degrees). It will be visible for about 5 minutes and when it fades, it will fade fast. This is because it will pass into the shadow of the Earth (sunset for the ISS). Of course, supernovae, comets, meteors, and exploding asteroids can rival the Sun and the Moon but only temporarily. This entry was posted in sky watching and tagged crescent moon and venus, International Space Station on October 7, 2013 by Stewart Dale Spencer. Watch the Space Station Go Over Tonight! The International Space Station (ISS) will travel over Central Texas tonight and you can see it if the clouds cooperate. It will be visible for 6 minutes (it moves pretty fast). Look to the southwest at 9:16 PM. It will travel from southwest to northeast, reaching a maximum elevation of 79 degrees. Just FYI, 90 degrees would be straight overhead. 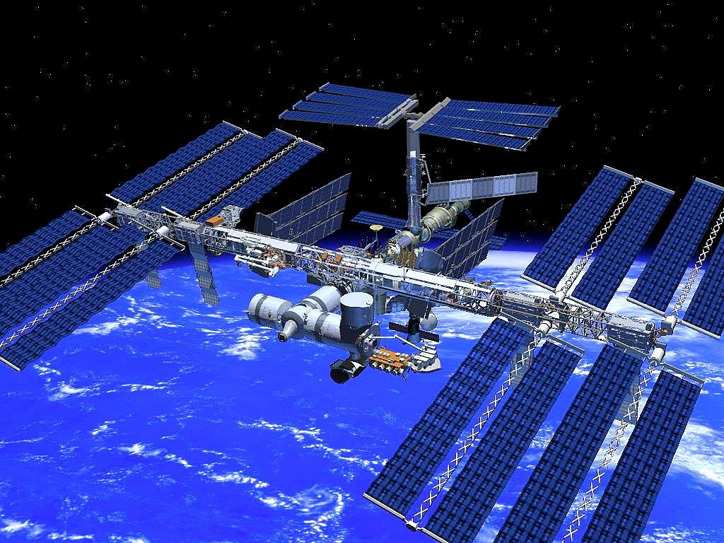 The ISS is the third brightest object in the sky, after the sun and the moon . . . even brighter than Venus, which you can see low in the west at dusk. You can sign up for a free text alert from NASA to let you know when the ISS will be visible in your area. It is always either in the early evening or the pre-dawn hours. The sun is below the horizon for you and me but the ISS is not yet in the shadow of the earth. In other words, the sun has not set or risen for the crew of the ISS. As you can see, I translated it for you at the beginning of this article but it’s pretty simple once you know the code. By the way, you can tell it’s not an airplane because there are no flashing lights and it is completely silent. If you have never seen it, you’ll be amazed! This entry was posted in Breaking News, Education, sky watching and tagged International Space Station, ISS on June 5, 2013 by Stewart Dale Spencer.